After making sure this week that we gave love to our Nana, our family elder, Katie and Eric met up this morning with fellow homeschoolers at the local senior care home to spread love to some of our community elders in celebration of Valentine’s Week. The freedom to structure service to others in our school day is, in our way of thinking about life and purpose, a definite advantage of schooling at home. I believe that developing a heart for service begins in the home, is actively modeled by parents on a frequent basis, and should be taught consistently and with the same care as any other academic discipline. Passing out valentines to the seniors today also gave Katie and Eric the chance (as they get quite frequently when we visit Great Uncle Ross) to be a part of the cycle of life from an early age. 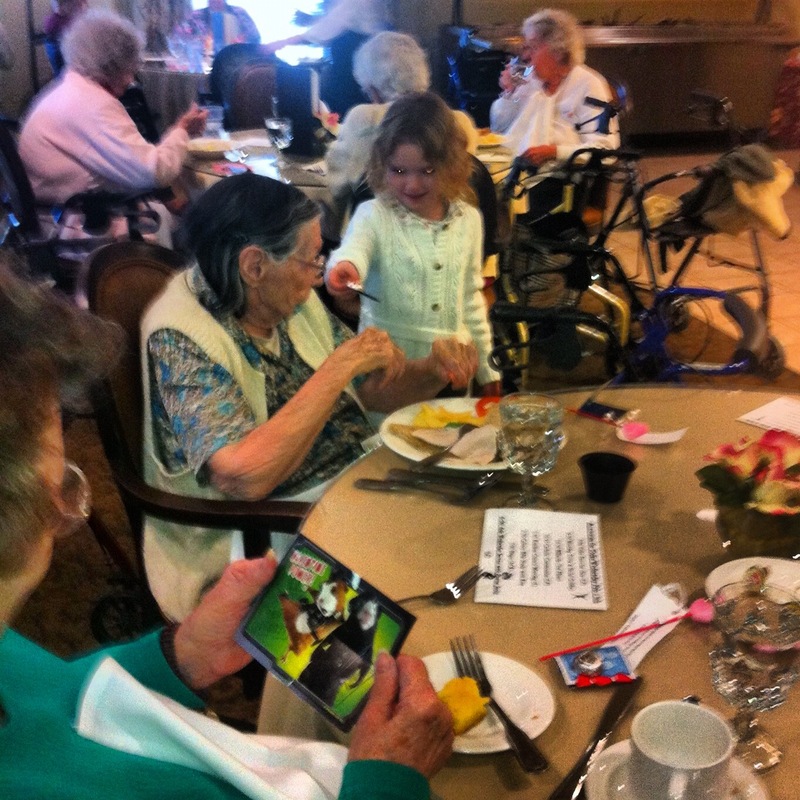 The seniors were delighted to see the young children and enjoyed talking with them. What a perfect opportunity to learn social awareness in a relevant and highly meaningful context. Later this afternoon, we took our valentines and our homemade pink-red-and-white M & M cookies to the park for a huge party with nearly 40 of our homeschooled friends and their parents. …while Katie chatted and made up games with girls of mixed ages. I love that our social time mirrors real world expectations and situations. In a real job, for example, we are never working with just our immediate peer group but always with people older and younger than we are. 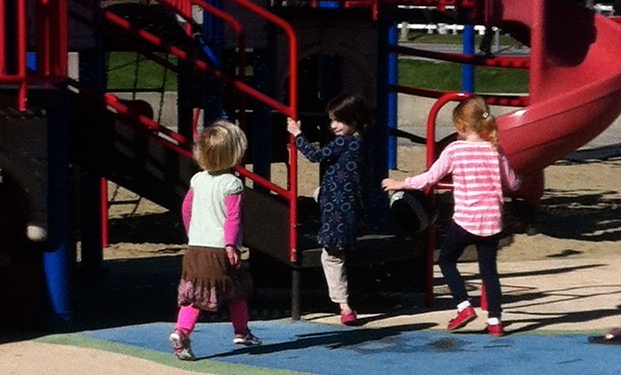 This deliberate, structured, and supervised social time is part of learning that crucial life skill. We get asked so much about the s-word here at the McGaugh Academy. Here is part of our answer to that query: yes, we most definitely teach our children how to be pro-social and productive within a set of cultural norms. We also teach them, however, to question those cultural and social norms. I gave Katie lots of independence to hang out today and snapped this picture from fairly far away…BUT I was observing the whole time. At home later, we debriefed and I was able to ask her relevant questions and lead her to learning moments (i.e. How she felt being the youngest, things like that. This group of girls is so sweet, so no worries there). So no, I don’t believe in shutting my children out from the social world (and I personally haven’t met many homeschoolers who do); I do, however, believe that it is part of my calling, as a mature and experienced adult, to guide them through that social world as best I can with clear and teachable objectives and goals. Katie always loves to see Bella and Chloe, and always looks for these sisters first thing when we get to the park. 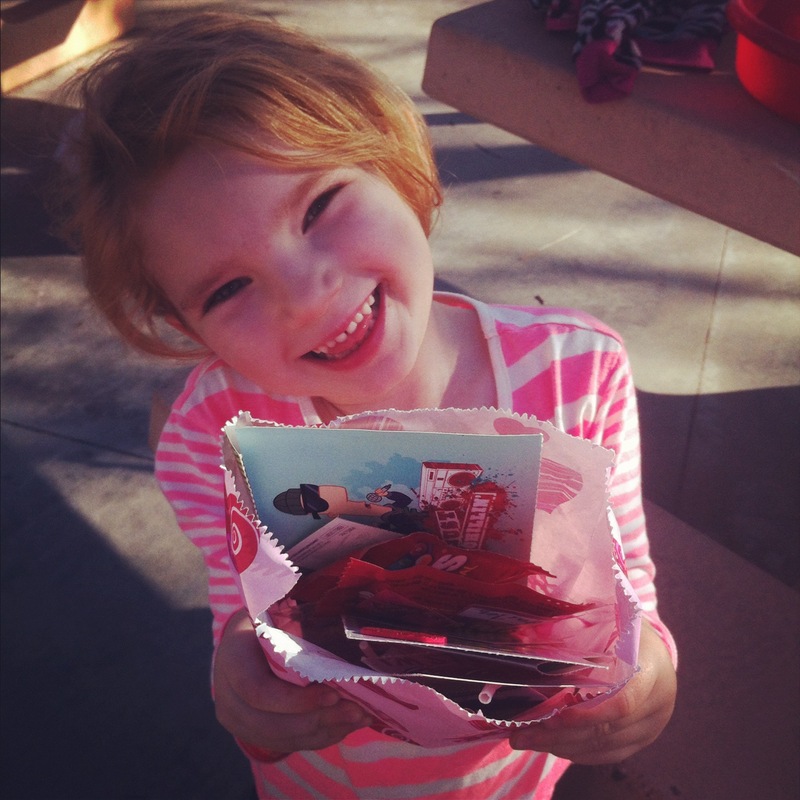 Katie was thrilled with her bag o’ valentines from our park crew! How lovely that we can have this experience which used to be (and maybe still is) traditional in elementary schools—I am glad and thankful that she does not have to miss out on this kind of fun just because we choose to conduct school at home! Regina’s beautiful and festive cupcakes! Man oh man, was there a spread at this shindig! A whole big table filled with all kinds of treats and fruit. 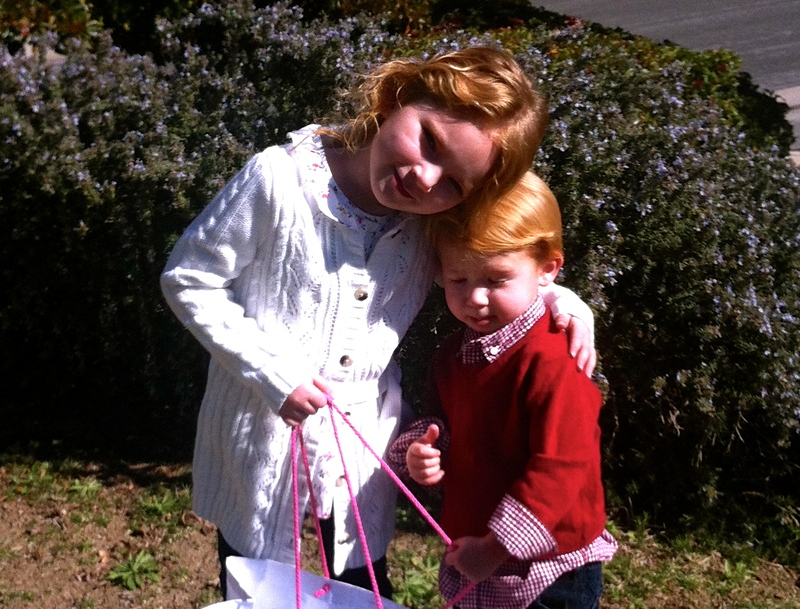 And Lisa was so thoughtful to bring bags for all the kiddos to use to collect valentines. So much fun! The kiddos had a blast, that’s for sure.